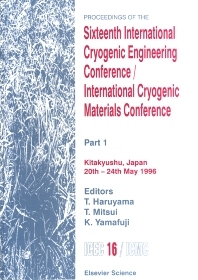 This book contains the proceedings of the 16th ICEC/ICMC Conference, held in Kitakyushu, Japan, on 20th-24th May 1996. The Proceedings are presented in three volumes containing a total of 476 papers from 1484 authors. The proceedings covers the main areas of: Large Scale Refrigeration. Cryocoolers. Cryogenic Engineering. Space Cryogenics. Application of Superconductivity. Oxide Superconductors. Metallic Superconductors. Metallic Materials. Non Metallic Materials. In addition there are seven Plenary Lectures covering such diverse topics as commercialization of high-Tc superconductors, the continuing development of the Maglev system in Japan, and the Large Hadron Collider project. The Proceedings comprise an excellent and up-to-date summary of research and development in the fields of Cryogenics and Superconductivity. For low temperature engineers, materials scientists and physicists in industry and academia. Chapter headings and selected papers: Part One. Plenary Lectures. A way to commercialization of high-Tc superconductors (S. Tanaka). Development of the superconducting Maglev system in Japan (M. Ozeki). Cryogenic properties of advanced composites and their applications (S. Nishijima). 122-Channel SQUID neuromagnetometer for studies of information processing in the human brain (O.V. Lounasmaa). Advances in cryocoolers (R. Radebaugh). The Large Hadron Collider project (L.R. Evans). Overview of the ITER project (R. Aymar). Large Scale Refrigeration. Refrigeration Plants. Cryogenic control system for the large helical device (T. Mito et al.). Long Term Operation. Compressors. Turboexpanders. Cryocoolers. Pulse Tube Coolers. Evaluation of experimental pulse tube refrigerator data with predictions of the thermoacoustic theory (A. Hofmann et al.). G-M Coolers. Stirling Coolers. Other Coolers. Cryogenic Engineering. Cryostats. A demountable type test cryostat for heat transfer and thermal optimisation studies of liquid helium containers (S. Jacob et al.). Cooling Technique. Superfluid Helium. Heat Transfer. Gas Properties. Measurements. Part Two. Space Cryogenics. ISO in-orbit cryogenic performances, system aspects (B. Collaudin et al.). Application of Superconductivity. Fusion. Cooling and excitation experiments of a single inner vertical coil (EXSIV) for the large helical device (T. Satow et al.). Accelerators and Detectors. Motors and Generators. Power Cables. Power Devices. Magnetic Levitation. High Field Magnets. Cryocooler-cooled Magnets. Current Leads. SQUID and Electronic Devices. Stability and AC Loss. Oxide Superconductors. Tapes and Wires. Improvement of electromagnetic properties of Ag-clad bi-based superconducting tapes through process control (S.X. Dou et al.). Part Three. Bulk and Thin Film. Superconducting properties and structures in Bi-2212 oxide synthesized by a diffusion process (Y. Yamada et al.). Magnetic Properties. Transport Properties. AC Loss. Other Properties. Metallic Superconductors. Nb3Al. Critical current density of Nb3Al superconducting wire for high field magnet by rapid-quenching process (K. Fukuda et al.). Nb3Sn. Other Materials. AC Loss and Electromagnetic Properties. Pinning and Stability. Applications. Metallic Materials. Mechanical Properties. Physical Properties. Absolute measurements of linear thermal expansion coefficients of copper SRM 736 and some commercially available coppers in the temperature range 20 - 300 K (M. Okaji et al.). Non Metallic Materials. Mechanical Properties. Overview of the fatigue behaviour of fiber composites at low temperatures (G. Hartwig, R. Hübner). Physical Properties. Functional Materials. Author index.